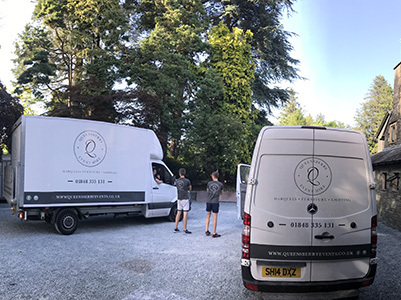 Queensberry Event Hire is a marquee hire and events company that specialises in marquee hire, furniture hire and lighting hire for weddings, garden parties and high-end corporate events throughout Scotland, The Lake District and Northern England. While also running a permanent wedding venue of our own at Dalswinton Estate near Dumfries. We offer a range of beautiful marquees from our original NZ import the Queensberry Pole Marquee to our Traditional Pole Marquees, pagoda’s and our stunning Clear Span Frame – all of which have been sourced from world-leading suppliers in New Zealand, Germany and of course Britain. We have carefully selected our marquees for a great combination of strength and aesthetics with their beautiful flowing designs. Our 12x30m marquee with long tables and flowers! Owned and personally managed by William Duncan and new wife Sophie Duncan, Will worked in the industry since his teenage years and throughout University. During his mid-twenties he spent fours years working for a high-end events company in Sydney, Australia. While working on many exciting projects down-under it confirmed his desire to return to Scotland and start a bespoke wedding marquee hire company of his own. 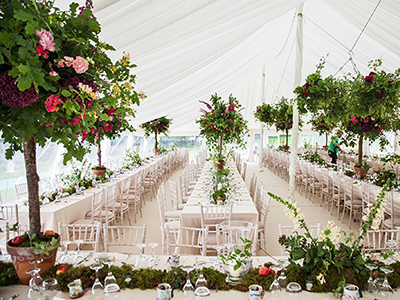 A combination of Wills’ experience, close personal service and attention to detail ensures you choose the right marquee and accessories to produce a successful and memorable event. We operate throughout Scotland, The Lake District and Northern England from our base near Dumfries in South-West Scotland. The cost of marquee will depend on the size, style and accessories you hire for it and can vary greatly depending on needs. Do you hire event accessories, tables and chairs without a marquee? Yes, we often supply other venues that need furniture for various reasons. Please view our hire products for our full range. If you don’t see what you need please ask us if we can supply or recommend and we’ll be happy to help. Do you conduct site inspections? We can offer a site visit prior to confirming a booking. We encourage you to call us to discuss your needs, we will then forward you our price guides and subject to this being suitable for you we will arrange a time to come and conduct a site inspection. We would charge for a site visit if more than 25 miles from DG2 0XU. Generally, our hire period is for one day. If your event is on a weekend we would look to install your marquee the Friday prior and dismantle the following Monday. For weddings, by request we can set up a few days prior to your event to give you time for any additional decorating (Wednesday for a Saturday wedding etc). How far in advance should we make our booking? We advise booking well in advance to avoid disappointment. A booking is only confirmed once a 30% non-refundable deposit has been paid. We are especially busy in May-October so please book a year in advance to avoid disappointment. 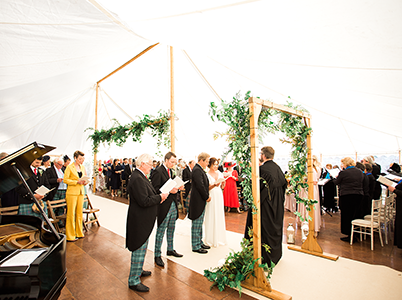 We cover the whole of Scotland, The Lake District and Northern England as standard – Due to demand for our unique marquees we travel to the Scottish Islands, Northern Ireland and Southern England at an additional delivery charge. Previous venues we have worked at include: Marquee Hire Ayr, Marquee Hire Carlisle, Marquee Hire Dumfries, Marquee Hire Glasgow, Marquee Hire Edinburgh, Marquee Hire Scottish Borders, Marquee Hire Perth, Marquee Hire Stirling, Marquee Hire Loch Lomond, Marquee Hire Cumbria & Lake district, Marquee Hire Penrith, Marquee Hire Fife. What is the hire process? Because every event is special, the first step is a site assessment. We need to know how to meet your exact objective, whether it be a wedding, garden party or corporate event. We also consider your site size and shape etc, no matter if it is a lawn, forecourt, terrace, deck, tennis court or swimming pool. We have a number of bespoke marquees of various styles, shapes and sizes, all with various roof, floor and wall options. So the next step is to decide the exact ‘look and feel’ you want. Interior Ivory/white linings can also be varied to match your theme when complemented by coloured lighting. Flooring options can vary depending on the event or budget, we supply coconut matting, carpet in a selection of colours and our most popular is our high quality polished Siberian larch wooden floors. Clear panoramic walls are highly popular so you can enjoy the views of your chosen location! Your event is important, so there’s no point in putting its success at risk. Our beautifully elegant pole wedding marquees are strong, 100% waterproof with wind and load testing to the same standard as framed marquees. For our framed pagoda marquees we have imported the very best German framework and PVC roof and wall sections. Lighting can make your event, so we provide a range of lighting options for inside and outside your marquee. Chandeliers and LED up-lighters for during the wedding meal, and turn off or dim the chandeliers for the evening. Our uplights can come with various differing colours to match the theme of your event. Now we can advise exactly what your marquee will cost, we have no hidden extras. If the quotation is acceptable a 30% deposit is taken and we send you a statement with an agreement detailing the style of marquee and day and time of installation for your event. Before any work starts, we confirm exactly where and how the marquee is to be installed. We build everything manually and do everything possible to minimise the impact on the venue by removing the use of any heavy machinery. Once completed we will once again clean the clear walls to ensure your views are not spoilt. If you would like we will have a team member attend your event to handle any last minute adjustments on your big day. You may need a wall removed etc, whatever you need just tell us. All that is left is to remove the marquee, clear the site of our equipment leaving your venue as clean as when we found it and send you a final statement. At this time we like to receive your comments about our services and products.